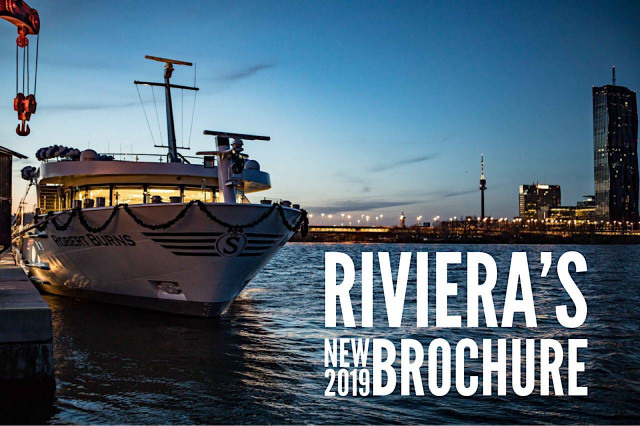 Riviera River Cruises’ has announced its new brochure and schedule of European river cruises for 2019, including a new train extension into the Swiss Alps, a new, smaller class of ship and expanded departures exclusively for solo travelers. Next year, Riviera will offer a total of 13 itineraries from five to 15 days, with 12 five-star ships sailing on nine rivers and waterways. Riviera’s Rhine Cruise to Switzerland will now include the option to add a train extension into the Swiss Alps on select departures April through October. Guests will cruise from Cologne, Germany, to Basel, Switzerland, over seven nights then stay in four-star hotels for three additional nights as they travel by train to the foot of the Matterhorn in Zermatt. Between Chur and Zermatt, they’ll board the Glacier Express, climbing cliffs and traveling through tunnels, passing forests, meadows, streams, and waterfalls. Riviera will launch MS William Wordsworth and MS George Eliot in 2019. The 443-foot William Wordsworth’s 88 suites are a minimum of 183 square feet and can accommodate 167 guests and 44 crew. The 361-foot George Eliot – a new, smaller class of ship for Riviera – has 70 cabins and suites that are a minimum of 161 square feet and can accommodate 132 guests and 36 crew. Both ships offer a second, smaller restaurant, The Bistro, with a more casual lunch and dinner experience, open kitchen and panorama windows that allow for al fresco dining. Expanding on its first two departures exclusively for solo travelers in 2018, Riviera will offer four departures that are single-supplement-free in 2019. Spring departures include the eight-day Douro, Porto & Salamanca River Cruise for Solo Travelers and Blue Danube River Cruise for Solo Travelers. The Blue Danube itinerary is available again in the fall, as is the eight-day River Rhône & Provence River Cruise for Solo Travelers. In addition to these exclusive departures, Riviera offers five cabins per departure that are single-supplement-free.